The jackets have a drawstring through the hood which can pose a strangulation hazard to children. No injuries have been reported. 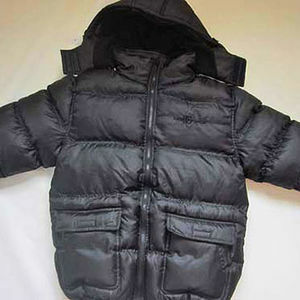 The recall includes about 2,400 boys' black hooded coats with dark gray drawstrings around the hood. The coats are 100% nylon on the outer shell with a zip-off hood. The wrist cuffs and waist band are elasticized. There are two front Velcro-flap pockets and an inner stow pocket on the coats. "Lion Force" is printed on the upper left side of the front of the coat and on the sewn on tag at the back of the neck. This recall involves boys' coat sizes 4 through 12. Burlington Coat Factory stores nationwide November 2010 through September 2013 for about $30. Remove the drawstrings from the garment to eliminate the hazard or return the garment to Lion Force Inc. for a full refund. For more information, call the company at (855) 441-5466. Lion Force toll-free at (855) 441-5466, 24-hours a day, every day.